I was stuck in traffic the other day and decided to listen to some music to pass the time while inching along the snail’s pace of parkway. When I turned on the radio I realized each station had been pre-programmed by my children to hip hop stations with loud lyrics and thumping bass, a swirling pulse of sound that felt like I was receiving angry CPR. My car moved rhythmically up and down and for a moment I felt compelled to lose my tie, throw on dark glasses and “stick it to the man.” I then remembered that, I am the man. I recognize the messages conveyed in today’s rap and hip hop are hardly respectful in how they depict women or personal and social responsibility. I find myself torn between the relentlessly creative and militant expression of a new generation of artists and their misanthropic, misogynist words and lifestyles. The music claws at you. My own children fashion themselves as suburban “gangstas” and have gotten me hooked on performers like The Black Eyed Peas, Justin Timberlake and Eminem (personally, I feel Outkast should have won a Grammy simply for the lyrics, “Ladies, lend me some sugar, I am your neighbor”. My iPod has been invaded by the likes of Big Boi, Snoop Dog, Akon, Ne-Yo, Ludacris, Dr Dre, Fat Joe (a man after my own heart), Gorillaz, Jay Z (he married Beyonce; enough said), and older, building block reliables like House of Pain and Arrested Development (a term people often use to describe me). There are Bosnian Herzegovian rappers Edo Maajka, Frenkie and Hamza. Turkish rapper, GurkanKan often jams with Sirgee and Kaisoze. Each culture wrestles with its own heritage and chafes against the social reins that restrain a generation itching to burst out and run from the problems they inherited but did not create. This highly charged music and lyrics can cause social fissures and generational stress fractures that shift the status quo, causing cultural upheaval and change. These artistic quakes both relieve and build pressure. Rap and hip hop are a confluence of musical artistry that can range from poetic genius to sociopathic nihilism. It’s a lyrical dark alley with seductive whispers and scabrous, dancing shadows. Whether some like it or not, rap and hip hop have become as American as apple pie; as with all Western phenomena, the cultural pollution has penetrated the institutional defenses of other societies. The graphic messages may offend some listeners, causing discomfort and resentment. However, music offers an outlet and expression to adolescents trapped between childhood and adulthood – too young to rationalize the consequences of a chaotic world and too old to forget what they have seen. Generations have always had to suffer the hand dealt by the preceding generation. Whether the fact that old men make wars and young men fight them or a world polarized by the few who have so much and the many that have so little. Adolescence, idealism and iconoclasm combine with inequity, injustice and anger to create a highly combustible form of expression. My car throbs – pumping like an iron lung along Elm Street as I drive to pick up my teenaged daughter. She is embarrassed, as usual, thinking that somehow I’m trying to pass myself off as someone who has a clue about music, her music. I retaliate by cranking the volume and mouthing the words to a song by Young Money , ” Call me Mr Flinstone, I can make your bed rock. ” – all the while moving my head back and forth, with a smiling overbite worthy of Eddie Van Halen in mid-solo. What she fails to realize is my appreciation of her music is not a disingenuous gesture to bridge a generational chasm. I actually like hip hop and readily accept it as my generation’s urban burden to bear. I have traveled extensively on business over the course of a 29-year career. As a road warrior, I’ve developed coping mechanisms which includes an emotional auto pilot that switches on as I move across countries and continents. I often return from these trips like a veteran returning from a foreign war and wonder why my spouse looked so tired and compromised. There was no band or patriotic appreciation for my sacrifices of the week. In fact, all I really got was the look. Men know the look. It is a silent statement of contempt that says, “You think you were fighting the Taliban? While you were sitting with your buddies in the officers club, I was in the bush fighting three little kids.” Immediately, I would be plunged into resentment. “It’s not like I have been sitting in a hot tub with my buddies” (well, at least not on this business trip). How hard can it be to hold it together for a few days when I am away? “Get some help” was my most common retort when I was rightfully called out for being unhelpful at dinner and bedtime. She would rationally respond, “The kids want to spend time with you, which means you need to get off the sofa and help… and preferably without the eye roll.” I would relent, but not without noting her obvious lack of appreciation for how important I was. Over the years, I realized she was right. How fleeting the time was when the troops were young, idealistic and hung on my every command. They wanted to cuddle, hear a bedtime story or just talk. 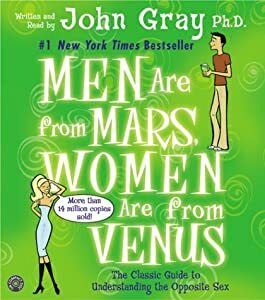 I learned from John Gray, who wrote Men Are From Mars, Women Are From Venus that everything (a person does in a relationship) is really only worth one point. Putting the kids to bed? One point. Jewelry? Sorry, just one point. I had to accept that a relationship was tantamount to a bank account where your surplus or deficit was determined by how many withdrawals or deposits you made. Deposits were best made without being asked; withdrawals required permission. I was constantly overdrawn. Still, I would wallow in self-pity and think, “I’d love for her to do my job for a day. Let’s see how she would feel after hiring, firing, traveling, then dodging angry clients and rabid shareholders.” Never mind that she had experienced an 11-year career as an executive when she finally retired. I got my first taste of my spouse’s logistical genius when we went away together and my brother-in-law and his wife agreed to watch the kids. They had no children, and we figured this experience might prime the engine of parenthood. The kids were excited … he’s a popular uncle — youthful, high energy, and funny. Upon our return home, my brother-in-law literally fled the house like it was haunted. As he was racing to load his car, he kept repeating, “I don’t know how you guys do this.” His wife was more subdued, but it was obvious the experience had set them back in their plans to have a family. As their car screeched out of the driveway kicking up pebbles, I asked my daughter, “What happened?” She was nonchalant: “Nothing, Dad, really. Every night Uncle Andrew would go to bed with a stomach ache and Aunt Marguerite would take over. I think he wasn’t ready for all the stuff that Mom does.” “How hard can it be?” I thought. A year later, my wife had a family emergency and we agreed she needed to go to Los Angeles for a week. I made sure I cleared the calendar at work so I could get everyone to school and then be home for the afternoon routine. The days leading up to her trip were filled with naive bravado. “We’ll be fine” I smiled. I was not really listening as she told me all the details to remember. It’s a known fact that men retain on average 50% of what their partners tell them; I’m no exception. “Just write it down,” I said absent mindedly as she talked to me while packing her bags. The eve of her departure she handed me something that looked drafted by a Chief Master Sergeant of the Marine Corps. 0630 – Breakfast, load backpacks, etc. This went on until 0830, when all the kids were supposed to be on different buses and out the door. I completed the tasks and raced to work, which turned into a confusion of business and carpool calls to other Master Sergeants confirming drop-offs and pick-ups, the logistics of music lessons, sports practices and play dates — all timed to within minutes of one another to allow for minimum collateral down time. From 1500 to 1800, I was watching, driving or cooking for what seemed like nine kids, many of whom I had never laid eyes on before or who lived on strange streets that I never even knew existed in this town. All the time I would be hearing, “Mom knows where Jimmy lives. Mom never makes me eat this. Mom already did that, Dad.” The mind-numbing routine went into overdrive at 1800 as the troops chafed against their substitute Sergeant. “The teacher said we don’t have to hand this in…” my son pleaded. I checked the Master Sergeant’s field manual. Page 3, paragraph 5 under Homework: Always sign and make sure that the homework is provided to the teacher. It is always due on Thursday. The Master Sergeant had expected this resistance and had made provisions. At 2330, I was standing over the kitchen sink wavering in a sort of half sleep, mindlessly putting dishes into the dishwasher and surveying what looked like a scene from a DEA drug bust. The house was trashed. The school snacks had been ransacked, the laundry pile seemed to have exploded and there were five more pages of coordinates dedicated to the following day. The next morning I felt like I had never slept. My secretary asked me if I was sick when I crawled into the office. “Yes” was all I replied. “So how is everyone?” the sunny voice asked over the phone from California. My son blurted, “Dad forgot my lacrosse stick today and left Jack at the field. His Mom had to pick him up.” Turncoat! Benedict Arnold! I was busted. “I wrote it all in the book,” she said with that disappointed tone. I felt like I was in front of the court marshal inquisition explaining how my unit got overrun so easily. I threw myself on the mercy of the court. Like Patton’s Third Army at Bastogne, the Master Sergeant finally returned to relieve her besieged fort. She walked in to examine clean barracks with all children’s logistics successfully executed. Kitchen Patrol was concluded. “Not bad,” she smiled as she surveyed the order. I never got around to telling her that I took two days of vacation just to deal with the chaos. I woke up the following morning and was relieved to once again see the guard tower to my left occupied. Driving to work, I smiled. My side of the “wall” never looked so good.